Sparsity plot of the Internet adjacency matrix, for the UCLA IRL 2013-06 data-set, with the nodes ordered by their Eigencentrality ranking. Each connection in the BGP AS graph is represented as a dot, connecting the AS on the one axis to the AS on the other. As the BGP AS graph is undirected, the plot ends up symmetric. The top-right corner of this plot shows that the most highly-ranked ASes are very densely interconnected. The distinct outline probably is indicative (characteristic?) 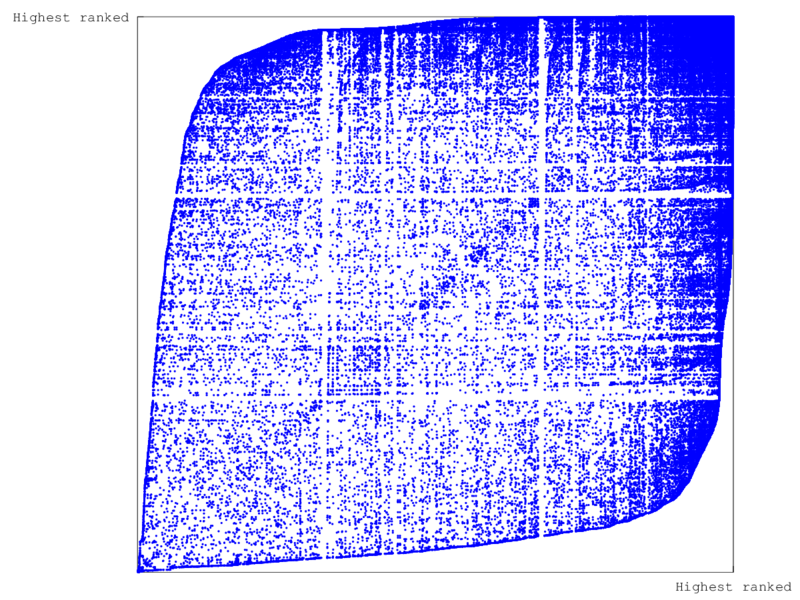 of a tree-like hierarchy in the data. Who are these top-ranked ASes though? Are they large, well-known telecommunications companies? The answer might be surprising.